1, Preheat oven to 375°F. 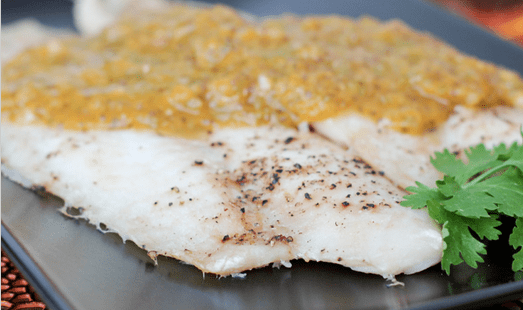 Lay fish out on parchment paper lined baking sheet. 2, Spread with some melted coconut oil, pepper and a squeeze of lemon. 3,Bake for [time length="20"]20 minutes[/timer], or 10 minutes per inch of thickness. 1, In a food processor or blender combine: peaches, onion, pepper, jalapeño, garlic and coriander, blend until smooth. 2, Place in a pot and bring to a boil, reducing to a simmer. 3, Add coconut vinegar, chia seeds and lemon juice, stir and let simmer a few minutes. 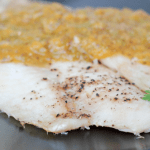 4, Serve peach sauce over fish fillets.